Pamper your wardrobe with our Basic Cedar Shirt Hangers. They're a natural, easy-to-use defense against pests, mildew and odors in a closet. Renew the potency of the cedar by gently sanding the surface with fine sandpaper. Joy Mangano Kid's Huggable Hangers Pkg/5 is rated 4.5 out of 5 by 44. Rated 5 out of 5 by bren3126 from Love the slim design. A little too large for some infant clothes, but overall perfect! Rated 5 out of 5 by ktbe22 from Love Love these Hangers I had wooden hangers in my babies closet. They took up so much room. Found these and Love Love Love them. Glad I changed them as they are slim and save more room in her closet. The hot pink color is great as they go with the color of her room as well. I highly recommend these to anyone wanting to buy hangers for a babies or childrens room. They will not be disappointed. Rated 4 out of 5 by busyboysmom from wish they came in a bigger kids size I'll start off saying I love these hangers. I have the adult size in my closet and I bought them for both of my kids' closets. They are great. The clothes don't slip off, and because they are so skinny, you can fit so much inside the closet. But as my boys get bigger, so do their clothes. My older son (age 11, size 10-12) is now at the point where his clothes don't fit on the adult size but are a bit small for this kid size. I wish their was one size in between or these were made just an inch or two bigger! Rated 5 out of 5 by CAROLANNS from GREAT Love these huggable hangers. I bought these for my friends baby. I have the regular size and it really gives you so much more closet space than others. Rated 5 out of 5 by libbylabel from Children's Huggable Hangers are great! I love using these hangers for my daughter's clothes. The clothes never fall off and never have the shoulder dimples, even when I hang up damp clothes. They slide easily on the Elfa shelving, so my daughter (age 6) can look through her clothes easily. Picking out clothes is so much easier than it was! Rated 4 out of 5 by MommyX4 from The good and the bad... This is my second time purchasing these specific hangers, previously from a different retailer. I love that they save space, a lot of space! However, they are somewhat fragile. The spot where the metal hook and plastic frame join can crack rendering the hanger useless. They are moderately priced, so if you can live with replacing some now and then and space is your bigger concern, then these are for you. I purchased them in ivory and I do not see a green tinge to this batch. Rated 5 out of 5 by Dragonfly71 from Love them ! Love these hangers. Perfect size for daughters clothes and they don't fall off onto the floor !! Changing over her whole closet.. Rated 5 out of 5 by tidyhomekeeper from Perfect for Small Clothes I'm upgrading my 9-year old daughter's closet and transitioning from plastic hangers. These were perfect; they hold the clothes nicely and take up less room in her closet. She loves them! Rated 5 out of 5 by AprilMom from Great solution for skirts! This is a review of the Huggable Ultra Slim Finger Clips. I bought these as an accessory for my daughter's felt hangers and they work perfectly to hang up her skirts. They're very secure and look nice. I'm glad I purchased them. Rated 5 out of 5 by JLAC3242 from I Absolutely Adore These Hangers I am so happy I made this purchase. I am a huge fan of the Huggable Hangers Collection being that I first got these for my husband and I when organizing our closet. That was 6 years ago. When we had our first child last year, I knew exactly what I wanted to purchase as far as hangers were concerned. On top of these hangers being so useful, I also lucked out and got them while they were on sale for $2.99!!! The pink color for my little girl goes so well with her pink and brown themed room.......and now that we are expecting this year, a little boy, I plan to buy him these same hangers in the blue whether they are on sale or not!!!!! Rated 5 out of 5 by ProudNana from Pretty Hangers I bought these hangers for my 4 yr old granddaughter. My son was organizing her closet and needed hangers. These are very nice because a 4yr old's clothes are small and regular hangers are too big. They have a velvety finish which keeps the clothes from falling off the hangers. The closet looks wonderful...organized and neat. Rated 5 out of 5 by ZBuggs from Great Hangers These are great hangers for a kid's closet. The ivory color is more of a beige than a white. I do not notice any green tinge to them. The pink and blue are pretty true to color on the website. I purchased a few of the clips to hang pants and outfit accesories, and I do like that the clips can be removed. These handers don't make any lumps or bumps in the shoulders of the clothing and the non-slip coating is quite durable. Rated 1 out of 5 by StephO from Color is Way Different than Stated I purchased the Kid's Huggable Hangers in ivory and was extremely disappointed by the color. The hanger was a light green instead of ivory as shown on the website. The Container Store should contact the manufacturer and let them know of the discrepancy in color. Rated 3 out of 5 by closetnut from Color is different I ordered the ivory hangers--I already have several of them. However, they seem to have a slightly green tint to them. Rated 5 out of 5 by GrandmaP from Girly Closet Essential! Soooo thrilled I found these wonderful pink Huggable Hangers for kids at the Container Store! It's the only place I could find more to add to my Granddaughter's closet. They're well made, just the right size for baby to girl's size clorhes, and the perfect shade of pink! Rated 2 out of 5 by JamieB from Color is not as shown Ivory is a very dingy color, looked almost grey and in the lighting from the closet had almost a light green tint to it. Was looking forward to these in my little man's closet as an alternative to the white plastic hangers. Disappointed. Returned. Rated 5 out of 5 by DebiA from Only Place I Could Find This Product I love the huggable hangers for my own closet. The Container Store was the only place I could find kid's huggable hangers. 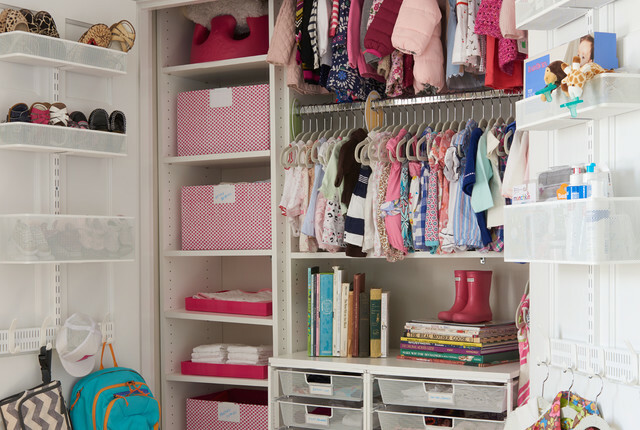 I love being able to also organize and make more space for my child's closet. Rated 5 out of 5 by florapedia from Great kids' hangers These hangers are just the right size for kids' clothes, and they are pretty. The clothes don't fall off, and the hangers don't take up a lot of space. Rated 5 out of 5 by LAI3 from Great Hangers for Kids Clothes The non-slip surface is great to secure clothes in place and ensure that the closet stays neat ! Rated 5 out of 5 by JRAF from Hangers that work! A great fit for my kids' clothes. And nothing slips ever!! Perfect for my little boy and little girl. Rated 3 out of 5 by LindsayM from Great hangers for adult pants I use these kids' hangers for my non-kid pants. I like the size of them, and I think they're slightly more cost-effective. I would have given them four of five stars, but recently one of them broke! The silver part apparently screws into the plastic part, and the plastic cracked/the metal popped out. It is not fixable. So one hanger is in the garbage... not the end of the word but I'm certainly not happy about it. Rated 4 out of 5 by TwinMama from LOVE them! I really love these hangers. They have some great features: 1. they are slimline so you can fit a lot of them into a closet 2. they fit preemie clothes! With twins, this was very important to me that they didn't just fit kid sized clothing and 3. I bought the additional stackers and pant hooks which come in handy. Overall, I will buy more of these. My only downfall is that it took them 5 business days to ship the order, although I got it in a timely manner after that...I am just anxious and wish they could get orders out the door a little sooner. Rated 5 out of 5 by MiaF from Great Buy! I love the hangers!! And this is the only place that I could find them, online or in stores! They really do save a ton of space. And the clothes do not slip off which is great for little clothes. Rated 4 out of 5 by citigirl from Space-saving anti-slip hangers Great space-saving hangers! The felted coating is also anti-slip, so it's great for wider necklines, cardigans, and jackets. The colors don't bleed, even if you put damp or wet clothing on them to dry, so have fun with color choice. I recommend buying the Huggable Clips for skirts and thicker pants (thin pants don't puff-out next to one another when folded over the bar, negating the point of the slimline hanger, or bunch under shirts for outfit-matching). The only reason these hangers didn't get a 5 star review is the lower bar on these hangers is a bit too low - I find when I hang pants or longer skirts, they greatly obscure my child's clothing below and bunch-up right above the bar below (the double horizontal rod placement in a child's closet is usually low enough so they can reach two rods to dress themselves, or at least, eventually reach two). I found a hanger long ago that had a narrower depth and only came in a deep tan, but of course, I cannot remember where I bought it and despite my best searches, cannot find more. For now, these are what I use. Rated 5 out of 5 by GrammaSandy from These hangars are great and by adding the finger clips the closet can stay organized. Rated 5 out of 5 by MamaP from Great clips! An easy way to convert a hanger to hold skirts or pants. Rated 5 out of 5 by MommyK from Great product! These hangers need to be add to any baby shopping list. We loved them! They are well made, they keep the clothes in place and care, they fit newborn clothes and the price was great! Rated 5 out of 5 by mommyjode from The best! I love these kid sized hangers. They have a velvet surface that really does "hug" the clothing and keep it in place. The clips work great for holding on to skirts and accessories. I love the cascading hooks for outfits. These hangers will more than double your closet hanging space! Rated 5 out of 5 by lawgirl3182 from Great Product--Fits Newborn's clothes I was worried that these "kid" hangers would not fit our newborn's clothes but they suprisingly fit! I would definitely recommend them, and the price was great! Do the metal hooks rotate? What size clothes do the Kid's Huggable Hangers go up to? My children wear size 10-12. I have used the adult hangers for some of their clothes, but they are sometimes too big. Are the kid's hangers suggested for their size or only suitable for babies/toddlers? My daughter has size 10/12 up to size 16 and these hangers still fit the size 16 shirts, sweaters &amp; tanks. The only issue I have with the bigger sizes is this: I do have to &quot;make it work&quot; a bit on some shirts, because the neck is too wide, but still works and looks great! (Her closet is really really narrow so these are the only size hangers that work...poor thing)! I need to know the size dimensions for the hanger. I am looking for a 14 or 16 inch hanger. Our Kid's Huggable Hangers measure 12&rdquo; x 1/4&quot; x 8-1/2&rdquo; h.
Can these hangers be used with wet clothing? We do not recommend this item to be used with wet clothes since it is made out of a velvet material. When Katie McBreen began planning the room for her baby girl, she knew she wanted something that didn't look like a traditional baby's room, but rather one that could transition and grow with her daughter. Katie, who is the Vice President of Communications & Public Affairs for the National Retail Federation, lives in a 1937 colonial home in the Chevy Chase neighborhood of Washington, DC. The couple's style is somewhat transitional - they like traditional things but Katie also keeps up with design trends and loves color but in a classic and sophisticated way. To help them achieve the look they wanted, they worked with Katie's friend and designer, Kate Collins. With the charm of the vintage home, also brought with it storage challenges - our in-home professional organizer, Beth Burgstaller, from our Contained Home service, helped Katie organize every inch of the former guest room.